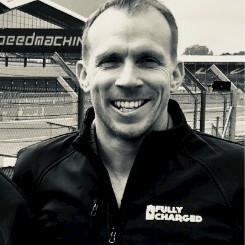 Dan Caesar, is a Director of The Fully Charged Show, he is responsible for scaling up the Fully Charged YouTube channel and Live events. Dan has long been a passionate advocate for all things Cleantech. Dan has held senior Comms roles with cleantech organisations, including Ceres Power, and formerly organised renewable energy and cleantech roadshows and events. Dan is an avid and passionate EV Driver, and very much enjoying his 300 mile range Hyundai Kona.